It's a sailor's privilege to see many beautiful views not available to landlubbers. Just a few from my own recent personal experiences: sunrise on Pamlico Sound, the long beach on the island of Abraao in Brazil, the wild cliffs on Ushant, but this week I found a view that tops them all, and it's one that will have all wooden boat owners nodding in agreement. Again, it's a view never seen, no less appreciated by landlubbers -- or indeed most boat owners. But I'm confident that it's a view that will have other wooden boat owners nodding in admiration and perhaps jealousy... a view of the Blue Moon's bone-dry bilge. Bone-dry bilge -- in mid winter! (Gotta get in there with a vacuum! The Blue Moon has always been a pretty dry boat, since it has none of the usual sources of seeping salt water. No leaky stuffing box, no through hulls, no holes at all in the hull. However, it has always had a mysterious leak through the deck. For years I have tried to track it down, but I never caught the leak in action, even when I was living on the boat on my long trek up the east coast of the US. Nevertheless, the leak was there, hiding for weeks at a time no matter how hard it would rain, and then unexpectedly showing itself with an inch of water in the bilge. It's been particularly irksome in the winter where I have always had to worry about water accumulating and then freezing. I visit the BM at least once a week throughout the year to check her bilge and to mop up any water with a special sponge that I keep handy, to soak up every drop. Keeping the floorboards up during the winter is another habit I've developed, to allow lots of air circulation, and to make sure I don't miss any water. 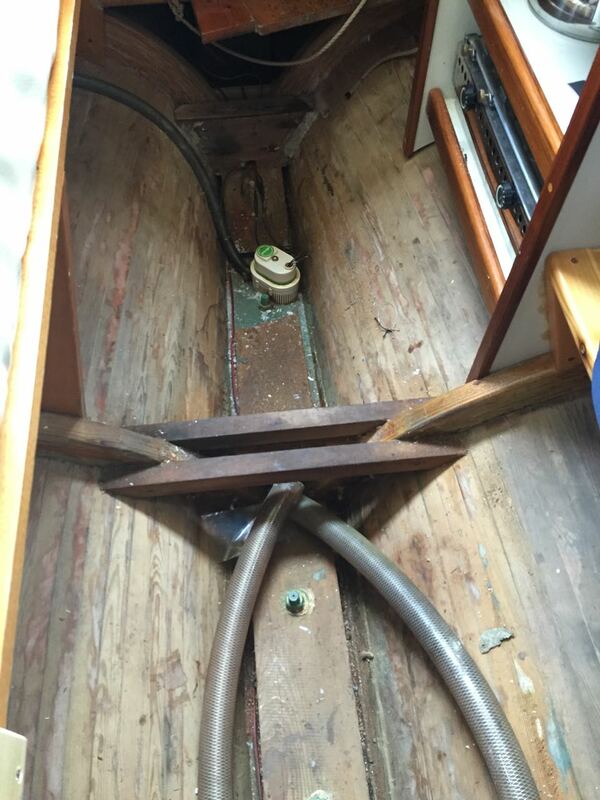 However, this fall, it suddenly occurred to me that perhaps the problem was with the BM's mast boot -- the tight covering that prevents rain and snow-melt from dripping down the mast and through the deck around the mast. Why this never occurred to me before is a mystery, but I've been so obsessive about the BM's deck that I always assumed the deck was leaking some place and never considered the more obvious source of water. At any rate, inspired by this guess, I replaced the mast boot and, voila, leak solved! There hasn't been a drop in the bilge since that day, and I can't possibly convey how good this makes me feel to normal, non-wooden boat owners. I don't need to explain the feeling to the rest of you.